For what I believe is the first time in years, the “classic,” ORIGINAL Age of Apocalypse logo is back (though lacking the oval and “After Xavier: The“). For over a decade, it seems a newer logo/font has been the “in” thing for use with the branding, from the 10th anniversary-onward. Add to that the fact that we have Magneto and Rogue prominently shown as well as a gratuitous placement of Weapon X (Wolverine)’s hand and claws, and this is something that absolutely grabbed my attention. (There’s also the fact that I revisited the saga in its entirety earlier this year, too!). While the characters are a bit “off” in appearance on the cover, this is still a great image to me, and I especially dig this rendition of Rogue. We open the story to find the Savage Land under attack by Holocaust–son of Apocalypse (and in this Secret Wars version of the world, Apocalypse is Baron of the realm, with only god Doom above him). 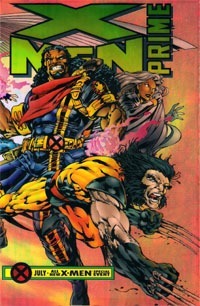 Holocaust is also one of Apocalypse’s Horsemen, sent to retrieve the young mutant Doug Ramsey (aka “Cypher”). Storm and Quicksilver’s squad of X-Men arrive to fight the monster and save Cypher…though things quickly go pear-shaped for all involved. We then shift to the aftermath and find what Mr. Sinister, Dark Beast, and the Summers brothers are up to as well as learning more about the situation, as Cypher pieces together an important bit of information. And finally, we get to Magneto’s squad of X-Men…and are left hanging for next issue. As mentioned above about the cover, Sandoval and Curiel‘s art has the characters looking a bit “off” to me…but despite that, the work is very good, and overall I like what I got in this issue. Maybe I would have enjoyed this even more with one of the “classic” artists that worked on the original 1995 Age of Apocalypse, but this IS a newer story, a new look at stuff, and is not actually that SAME Age of Apocalypse (evidenced especially by the presence of modern Tablets that didn’t exist in any sort of commonality back in ’95). There are some differences–Magneto seems overly muscled, Cyclops’ hair seems a lot thicker, longer, and far more wild, and Sinister’s coloring seems more muted than I expected–but in and of itself, I’m cool with it. I enjoyed the look and feel of this issue. Another selling point for me was very definitely that Nicieza–one of the writers on the original story–is the writer here on this book now. I generally find that I am far more accepting of changes to core elements of a story in new “takes” on an original when an original creator is involved…it’s sort of their seal of approval, being involved. As we only have a few issues for this story as opposed to several dozen for the original, Nicieza deals nicely with scaling down the cast for the main story while directing our focus a bit. There’s a certain familiarity here that I truly appreciate, while the differences seem to come primarily from the fact that this is an Age of Apocalypse that is part of Battleworld and not solely its own thing…so certain continuity elements simply don’t exist here that did in the original…and/or they flat-out don’t matter. The story rang true to my reading, even more than probably anything else done with the AoA in the past 10 years. You don’t need to have read the original story to follow this…there’s plenty in-context to move things along. As a part of Secret Wars and the whole “NOW, ALL THAT REMAINS…IS BATTLEWORLD!” this functions believably as simply an alternate take on/situation for X-Men characters. 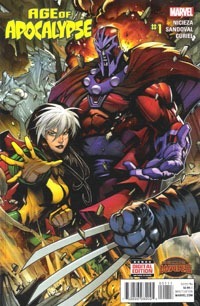 If you’re familiar with and enjoyed the original Age of Apocalypse epic, this version of the characters seems plucked from the heart of that, rather than some new status quo picking up years after the original. The $4.99 cover price is a bit steep…and though I think I knew OF it a few weeks back looking ahead, I forgot about it, so was somewhat surprised when I re-realized what I’d paid for this. That’s probably also credit back to the cover imagery and logo and then my enjoyment of the story–I was distracted and not bothered by the price. We get about 30 content pages–more than the standard 20-22, so as much as any are these days, I’ll accept that as “justification” for the $4.99. I thoroughly enjoyed the issue, and despite trying to shift to Marvel‘s Digital Comics Unlimited, I may actually keep current with this series. Highly recommended to Age of Apocalypse fans in particular…this may not be nearly as special as the original story, but as a new story it captures something that really works…at least to me. We pick up some time after the previous issue, and find our focal characters split. Dazzler and Exodus appear, and find the remains of the Nanny robot that was tasked with protecting Rogue and Magneto’s son. 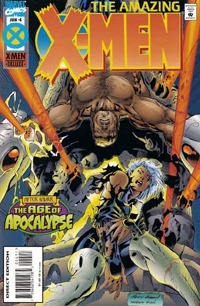 We then change scenes to later and elsewhere, to Apocalypse personally interrogating Rictor over his failure. We flash back from there to Gambit and Lila running from Rictor and those characters’ confrontation…and back to Apocalypse. Another flashback shows Jubilee with a child running from Guido (Strong Guy) who has apparently betrayed the group. We see more of the interrogation, and flash back to Rictor vs. Strong Guy and Strong Guy vs. Gambit. Gambit is forced to make a decision…and we move back to Apocalypse and learn of Rictor’s outcome as well as Strong Guy’s…and end on Gambit and Lila. This issue is a great illustration (no pun intended) of how great single-issue comics can be when treated AS a single issue, even if it’s part of a larger story or mini-series or such. The storytelling is stylistically quite different from the previous issues…instead of things simply unfolding chronologically, this issue picks up "at the end" and while we learn of where things ARE we’re caught up on how things got there from where we ended from the previous issue. 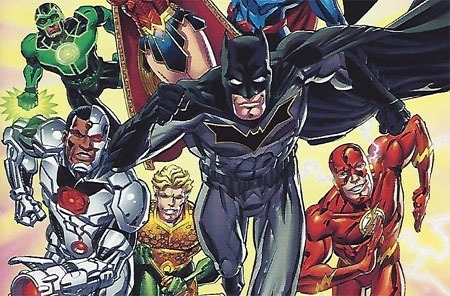 Though the characters, their mission, and this 4-issue series are part of one ongoing story, this is "just" one more issue, existing AS an issue, as its own entity, rather than simply being the fourth chunk of a singular story that was split into four equal pieces to be serialized. I really enjoyed this shift in style, despite a bit of confusion at first. I certainly would have benefitted from a "Previously…" page as I did not recall the ending of the previous issue; but as this issue unfolds and we have the flashbacks and glimpses of the present, one is caught up rather easily (though Guido’s betrayal is still a bit iffy to me). I was distracted enough by the story that the art was just "there," good and all but it didn’t distract me. I simply followed the story and appreciated the visuals for what they were. 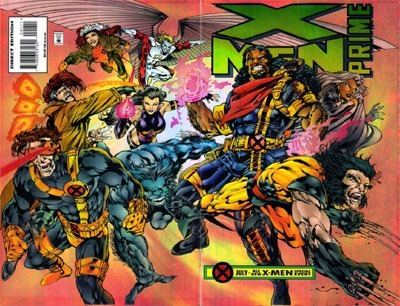 I did not recall the events of this series or issue, but here found it a fitting end…concluding the adventure, leaving things at a place simultaneously dark and light, and directing readers to the end of the Age of Apocalypse itself by way of Amazing X-Men #4 and then X-Men: Omega. I vaguely remember when this series was originally out. I don’t remember details, but I’m supposing (in retrospect) that the Iron Man connection is what caught my eye…though there was probably Wizard coverage, and I wasn’t unaware of X-O Manowar from the #0 issue at least. Of course, there was the video game, which this is based on or inspired by or what-have-you. Given Acclaim was doing the video game, and had bought Valiant, it makes a lot of sense that there’d be a tie-in comic. While I’ve found many of the "later" Valiant comics, this issue has eluded me until recently when I noticed both issues of the "crossover" on eBay. Being edged out on the bidding at the last second I looked for other instances, and including shipping scored a copy of both this X-O Manowar/Iron Man issue and the companion Iron Man/X-O Manowar for the price of a single contemporary Marvel comic. While this oughtta be quarter-bin fodder, not finding it that way made it worthwhile to me to pay a bit of a premium just to HAVE the issues. The cover looks rather odd to me–far from an ideal thing, and rather generic. There’s something a bit "off" to me about both armors…probably the "early digital" art, which may even be a still from the video game (I don’t care enough to investigate further). 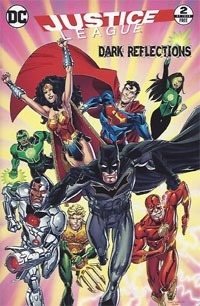 Either way for a cross-company crossover this does not look like anything special from the cover alone. Upon opening the issue I immediately saw an art style that did not appeal to me. I don’t know if I’ve seen or liked anything else from Andy Smith, but in this issue, I am not a fan. It’s not horrible art, and it’s certainly far, FAR superior to anything I could possibly do myself. It gets things across and isn’t too wonky or anything…basically it does its intended job but does not stand out as anything special. 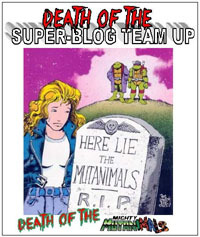 Seeing Nicieza‘s name as the writer was an immediate appeal for me…but getting into the issue I felt rather left down. This thing’s all over the place and does not feel developed at all. We jump from villains we aren’t given much about to other villains; and world to world. 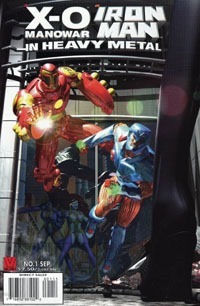 I found myself confused to realize partway through that we’re actually dealing with MULTIPLE sets of Iron Man/X-O Manowar and not just the two characters being matched up for a single double-universe adventure. I believe this was a time when Iron Man had been "de-aged" or replaced by a younger parallel-dimension version of himself or some such, so that’s not ENTIRELY off-putting to "learn" here but that’s not really explained. And given this is an issue from Acclaim, it’s certainly well-past the X-O Manowar stuff I was familiar with, am familiar with…and having just read a 2015-published issue of the contemporary X-O Manowar series found the character dull and not at all 3-dimensional here. I’ve often enjoyed Nicieza‘s work, particularly his X-Men stuff, and find myself seeing this as being completely hobbled by BEING a video game tie-in, presumably with a bunch of "checklist" points to be hit during the issue. And with Acclaim and Marvel both getting to publish an issue, there’s probably a certain bit of symmetry that had to be achieved as well. All of which ultimately leads to an issue that I didn’t enjoy. I would be incensed at having paid full price for this–particularly had it been published in 2015 and passed off as anything supposedly special. However, it’s still something that I’ve been curious about for years, and a definite "artifact" of its time…so despite not enjoying the issue, I do expect I’ll read the Marvel-published one as well just to "get the story," and all that. Unfortunately this does somewhat taint my expectations toward the bulk of the Acclaim-published Valiant stuff and makes me hesitate just a bit on diving into reading any of those anytime soon. Gambit’s crew has located the M’Kraan crystal…but realize the task before them–to actually steal it and return with it to Earth–may well be impossible. Still, they get beamed down to the planet, where their immediate welcome is quite hostile. 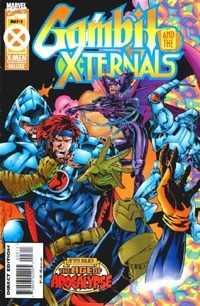 As the group splits, Gambit and Deathbird follow Lila into the crystal itself after she was pulled in…where they meet a creature who explains to them what the crystal is, what it can do, and how important this mission truly is. Outside the crystal, the rest of the group faces an additional welcome party of Gladiator and Rictor as the situation goes south in a hurry…leading them to enter the crystal as a final, desperate attempt at survival. 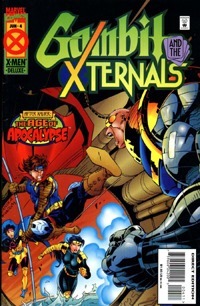 Once in the crystal, they’re just in time to see the crystal accept something of Gambit, and finally with Sunspot’s sacrifice, the group attempts to return home. This issue seems to be the core of the series…we have the introductory stuff and setup in the first issue, the characters regrouping and dealing with being tossed across the universe in the second…here we actually see them get what they came for and presumably wrap up. Of course, there’s one issue to go, and we end on Lila’s declaration that she will not fail (to get them home)…but we don’t actually see them get home. The art continues its consistent good quality as with the previous issues…really no particular complaint or gripe from me. I liked it, and sped through the issue without being "taken out of the story" by anything weird in the art itself…I simply saw the characters and situations and that’s what the art is supposed to do. Gambit’s internal conflict here is easy for me to empathize with–the feelings he’s continued to hold onto for Rogue, challenged by his presently being with Lila. That he’s forced to deal with his own feelings in order to save the universe itself is a rather deep thing to ponder. I’m also not familiar with Jahf, if he’s appeared before or not…there’s just enough ambiguity that I could see either option equally likely. Other than Bishop himself, I think this is the first we’ve seen any "confirmation" in-story that this reality is not the "real" one, and for the first time (maybe ever) I feel like there’s a reasonable hint of how the AoA reality has "continued to exist" to present-day. The issue’s end is lofty–a declaration that failure will not happen. It nicely caps the last couple issues, but leaves things open for the next issue and conclusion of this particular mini. There’s no doubt the characters will face further hurdles before any of them make it to X-Men: Omega, and it’ll be interesting to see the "bridge" between this issue and that.